We’d love your help. Let us know what’s wrong with this preview of The Penitent by A. Keith Carreiro. Pall Warren lives in a world filled with unrivaled natural beauty, constant struggle and shifting perceptions of reality. The time frame of his story is set in a medieval context. Peace over the land he lives in is an illusion only. Pall discovers that war not only must be waged against competing interests within his own land, but also against unnerving entities filled wit Pall Warren lives in a world filled with unrivaled natural beauty, constant struggle and shifting perceptions of reality. The time frame of his story is set in a medieval context. Peace over the land he lives in is an illusion only. Pall discovers that war not only must be waged against competing interests within his own land, but also against unnerving entities filled with extreme malice toward the human race. As the journey to discover who he really is unfolds, he learns that appearances are not at all what they seem to be on their surfaces. This story is ultimately about the battle between faith and disbelief, as well as how hope and cynicism clash against one another in the human spirit. To ask other readers questions about The Penitent, please sign up. As a "Part I", I knew this one was not going to quite finish, but I kind of wish that more happened? As it is, this story feels very much like backstory. I think I'll wait until I finish the next one before I write a proper review. The Penitent: Part I traces Pall Warren's story in the aftermath of a devastating battle. He meets the mysterious John Savage, gets caught up in the pillage of the farm they're sheltering in, and faces the strange otherworldly creature, Unger. Carreiro jumps back an As a "Part I", I knew this one was not going to quite finish, but I kind of wish that more happened? His writing style hearkens back to an older style, a little more stylistic and laborious, complete with random outbursts of poetry--possibly due to Carreiro's background as an adjunct professor of English. All the Shakespeare must come out somewhere, I guess. The Christian themes don't really come up that much in this one, other than some supernatural events and visions (it's much more obvious in the next book: the Penitent - Part II). Even though it's only Part 1, and I expected it not to have a complete arc, I personally wanted more story in it--more moving forward action, instead of reflections on the past. As it is, I'm not going to give any star-rating for this review because I really don't know how to rate it. Okay, I admit it. The book is better than well-written. Descriptions and characters are outstanding and vivid. The story line is really captivating. But--I didn't read much of it. If I want to sleep at night sans nightmares, I cannot read, watch, or listen to horror stories. This one is. So ... even though I didn't personally like the genre, I can admire the writing skills. I still have to give this terrifying sci-fi five stars. The Penitent is Part I of The Immortality Wars. Pall is a young man Okay, I admit it. The book is better than well-written. Descriptions and characters are outstanding and vivid. The story line is really captivating. But--I didn't read much of it. If I want to sleep at night sans nightmares, I cannot read, watch, or listen to horror stories. This one is. So ... even though I didn't personally like the genre, I can admire the writing skills. I still have to give this terrifying sci-fi five stars. The Penitent is Part I of The Immortality Wars. Pall is a young man at the beginning of the book, a little dazed at his first real exposure to deadly battles. As he stumbles away from the countless dead and dying soldiers, he encounters John, a much more experienced and expert soldier than he is. They become companions, not even knowing if they fought that battle on the same side or not. It's very shortly after that point--when Pall begins to experience worse than war and John spots an enemy more deadly than any either of them had met before--that I quit reading. Sorry, Mr. Carreiro. Rank cowardice, I realize. So go ahead and buy it, if you dare. Available from Amazon. Pall's life has never been easy. From the moment he was born, he's had to put up with the fact that people shun him. Part of him often wonders as to why they do so, but he does his best to ignore the things he cannot understand. Living a life full of heartache and constant struggles, he immerses himself in the world around him. War and pain are things he's only ever known, yet deep inside he knows there's something more out there. He just has to be patient until he finds it. A dark, yet bitterswe Pall's life has never been easy. From the moment he was born, he's had to put up with the fact that people shun him. Part of him often wonders as to why they do so, but he does his best to ignore the things he cannot understand. Living a life full of heartache and constant struggles, he immerses himself in the world around him. War and pain are things he's only ever known, yet deep inside he knows there's something more out there. He just has to be patient until he finds it. 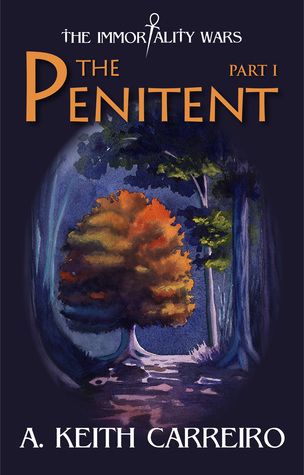 A dark, yet bittersweet story, The Penitent immerses us in the circumstances of Pall's life. This is a man who's been dealt card after painful card from the moment he came into the world. His father never lets him forget the reason behind his existence. Neither do the people within the small town they live in. Nevertheless, he does his best to find traction in the world he lives in. A. 's unique way of storytelling captures the reader's attention. It makes the reader want to delve further in finding out whether Pall changes the circumstances of his existence. If he's able to find meaning within the chaos he deals with on a daily basis. Touched by the Hand of God, Pall refuses to leave things as they are. He will do what's right no matter the cost. The beginning nearly made me want to stop...but keep on reading-- this book is worth the challenge. It ebbs and pulls you in and when you think you can guess the end....SURPRISE! I was disappointed when I finished the book-- I WANT THE SEQUEL!! Keith lives in Swansea, Massachusetts. He has an abiding love and passion for the visual, literary and performing arts. At an early age he started playing the classical guitar and studying privately with Maestro Joseph Raposo, Sr. (Boston Conservatory of Music) until he was 17. He started writing poetry in high school. Reading, music, storytelling and movies became singular passions for him, all o Keith lives in Swansea, Massachusetts. He has an abiding love and passion for the visual, literary and performing arts. At an early age he started playing the classical guitar and studying privately with Maestro Joseph Raposo, Sr. (Boston Conservatory of Music) until he was 17. He started writing poetry in high school. Reading, music, storytelling and movies became singular passions for him, all of which set him on a lifelong path of exploration in creativity. In the spring of 2014, he began thinking in earnest about what life would be like in the future. Given the fact that civilization would be intact, what would people 500 years from now be like? How would technology change them? What effect would mankind’s aggressive personality traits and competitive, warlike spirit have on the ever spiraling rush toward scientific mastery over the universe? How much would the practice of scientism affect, even replace, religion as we know it today?